Phast Phood – One, two, three…onigiri! Looks like PhDJ’s in an Asian summer spell with the recent posts–the siomai and the lunchtime haiku. While the Western world is preoccupied with football and psychic octopi, from which takoyaki balls are made from, here’s another Asian food post. 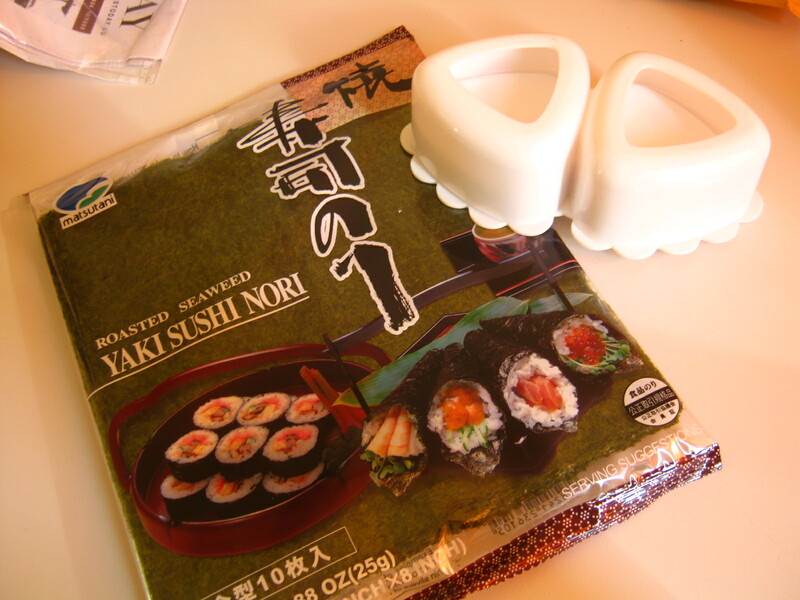 In a recent care-package from home, my mother included my never-been-used twin onigiri molds. Now, wait a sec…what IS an onigiri? As is nicely explained here, onigiri is a pressed rice ball. Well, “ball” here can come in different shapes, like triangles, cylinders…even Hello Kitty heads. 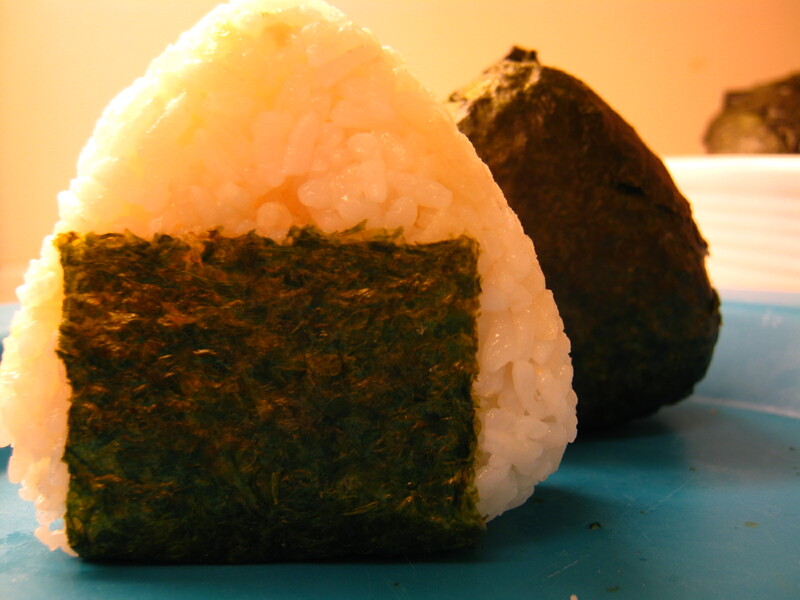 Traditionally, onigiri were made by hand, hence the basic ball, triangle and cylinder shapes . 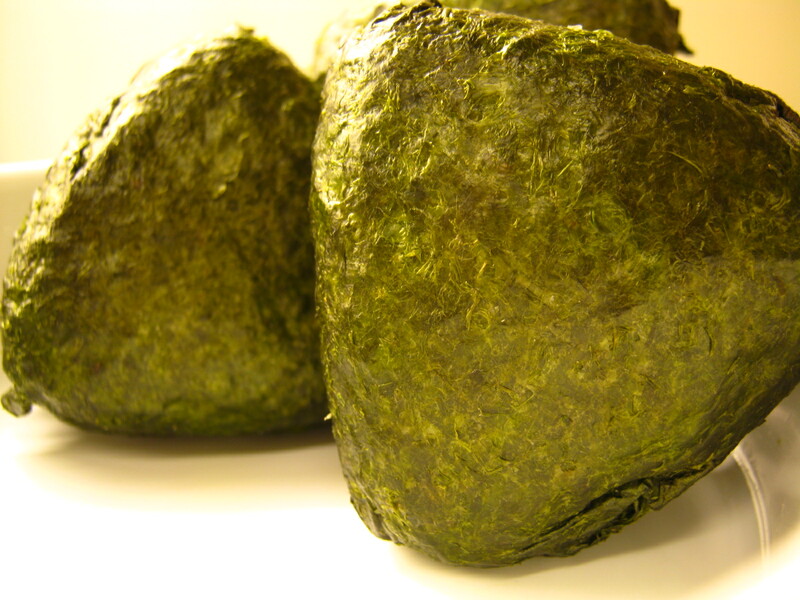 Nori (a kind of seaweed, often roasted and pressed into sheets) wrappers are optional–though they serve as edible Saran wraps, as these rice balls are often packed by travellers. For this set of onigiri, I used a mold. For practical reasons–as much as possible (since it’s summer), I want to minimize hand contact with cooked food to prevent spoilage, AND I hate the feeling of sticky rice between my fingers! Cook Japanese rice according to product instructions. Rinse the insides of the mold. You may sprinkle salt* to coat the inner walls. Fluff rice. Half-fill the mold with the rice (do not press!). If you have fillings on hand, make a shallow well in the center. Add the filling, then loosely cover with more rice. Cover with the other half of the mold and press down. Unmold the rice ball. Serve as is, or wrap it with nori. Rice. Sorry to say, but our favorite staple–long-grain Thai rice–just doesn’t cut it. I had to learn it the hard way in a previous attempt, with brown jasmine rice. 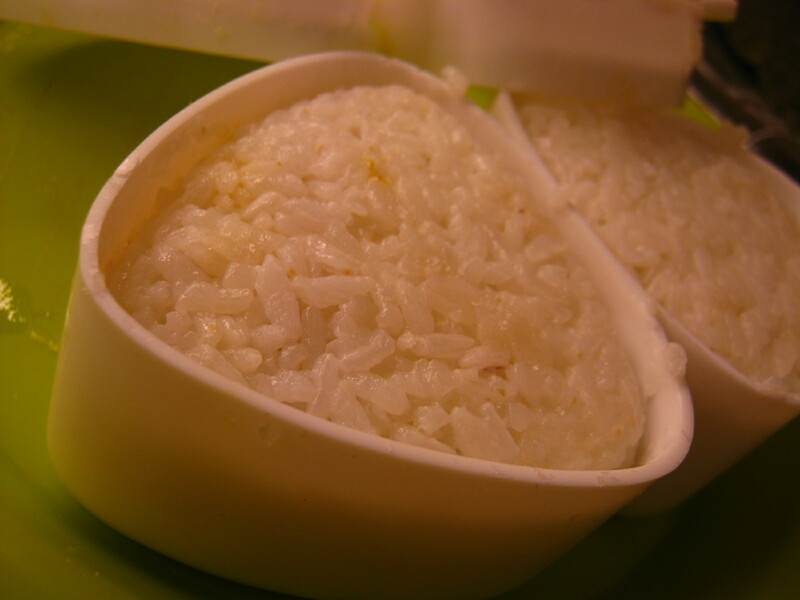 Japanese rice is sticky enough to keep its molded shape, but not too sticky and heavy like glutinous rice. Salt? The simplest onigiri is an unfilled rice ball coated with salt with a strip of nori to keep sticky fingers at bay while eating. Salt here serves as a flavoring AND as a short-term preservative (well, unless you bury it in salt, but the result will be very unpalatable BUT preserved). Fillings? One great thing about onigiri is that anything that goes well with rice can be stuffed inside the ball, triangle, cylinder…what have you. 🙂 Just make sure that it’s sufficiently dry enough to not seep through the rice and make the structure crumble, nori or no nori. No mold? Well, you can try using a small teacup + cling-film…or just have very clean hands dampened with salted water. What makes this dish as a perfect item for packed lunches and quick food for grad-school foodies is that this can be made in 15-minutes flat, provided that there are fillings on hand. 15 minutes–that’s the average time in cooking rice. To simplify things further, especially for those watching their budgets and summer calories, the fillings can be made in advance and stored in the fridge. Or the rice balls can be made in advance, wrapped in nori, then in cling-film, then placed in freezer bags and boxes before storing them in the fridge (or freezing them)–to eat them, just pop a piece or two in the microwave for a minute then it’s good as fresh. Fancy schmancy. I also need to level up my bento-plating skills to give justice to any fancy bento box. 😀 We’ll see what I can come up this week. you can make thai or jasmine rice have the same consistency as japanese rice… for a 3cup rice preparation: just before it boils, add 2 tbsp vinegar (to bleach it white) and 1 tbsp white sugar to make it sticky. sugar will also make it keep longer.